Donald Trump celebrates Black History Month by making it all about him. President Trump celebrated Black History Month today in the most Trump-ian way possible: by making himself the victim and complaining about the press. Also he really, truly may think Frederick Douglass, who died in 1895, is still alive. It's actually pretty believable at this point. 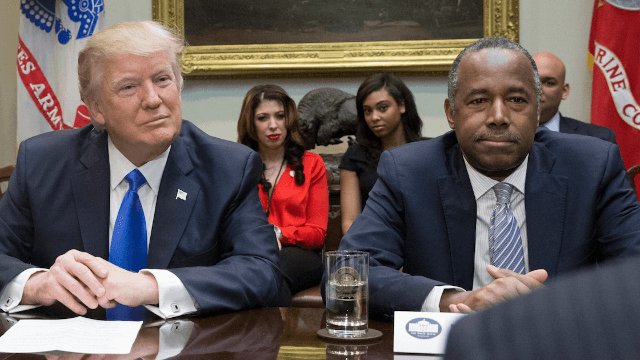 Sitting in the Roosevelt Room this morning for a "listening session" with BFF Ben Carson and a group of African-American leaders, President Trump probably didn't do a whole lot of listening. But he did do some talking. Last month we celebrated the life of Reverend Martin Luther King Jr., whose incredible example is unique in American history. You read all about Dr. Martin Luther King a week ago when somebody said I took the statue out of my office. And it turned out that that was fake news from these people. Fake news. The statue is cherished ... but they said the statue, the bust of Dr. Martin Luther King, was taken out of the office. And it was never even touched. So I think it was a disgrace. But that's the way the press is, very unfortunate. Using historic civil rights figure Martin Luther King Jr. as a prop to air his own personal grievances at an event meant to commemorate Black History Month? Yeah, sounds like our President. The incident he's talking about actually did happen shortly after his inauguration last month, when a member of the presidential press pool falsely reported that a bust of Dr. King that President Obama put in the White House had been removed. But the report was quickly corrected and the reporter apologized for his mistake. Frederick Douglass died in 1895. Does President Trump not know this? Twitter isn't sure that he does. Okay so Donald Trump apparently thinks Frederick Douglass is still alive. Good start to Black History Month. "Frederick Douglass, great guy, know him personally. He sent me a text this morning to tell me he appreciates my support"